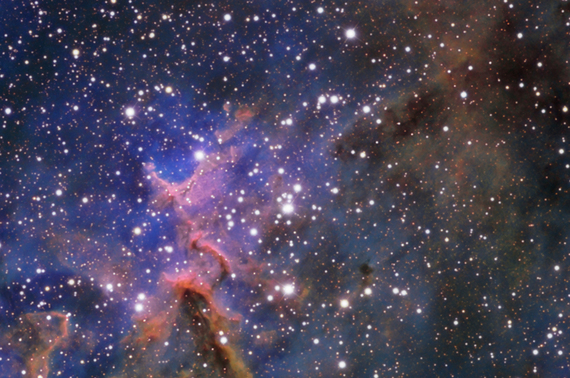 The center of the well known Heart Nebula, IC 1805 is also cataloged as Melotte 15. IC 1805 lies some 7500 light years away from Earth. It is located in the Perseus arm of the Galaxy in the constellation Cassiopeia. This is an emission nebula showing glowing gas and darker dust lanes. This nebula is formed by plasma of ionized hydrogen (HII) and free electrons. The hydrogen has been ionized by ultraviolet radiation from young hot stars. The nebula thus exhibits a characteristic red spectral glow. This image was created by combining some high-resolution RGB data taken using the SSRO RCOS telescope and an SBIG STL-11000M with some excellent narrow band (Ha/SII/OIII) data taken using a Takahashi FSQ106N and an SBIG STL-6303 by Neil Fleming in Boston, MA.